Last two weeks I’ve finished the NPP implementation of the Haar Cascade detector, it is now fully ported to PCL. I’ve included Alex Trevor his organized multi-plane segmentation to people api as well, so that people can do background subtraction based on the planes found in the image. This week I wrote the final report summarizing the work done as well as how to use the module. I’ve added an XML interface to load/save person specific configuration files. The generic XML file is also saved in trunk. This will allow people to tune the kinematic chain according to themselfs to improve on the tracking results. This XML interface is currently already in the process of beeing extended to an v0.2 which will also include the directed acyclic graph (DAG) description of the kinematic chain tree, allowing users to reconfigure this and place the root at a different position. The XML interface is now part of the PersonAttribs class and in the examples can be used with the -XML tag. For the summer I’ll have a student to help me with the training process as we now got access to the AWS cluster to enhance our training facilities. We will also be looking into training on GPU. If anybody has good knowledge about how to achieve this (RDF training in CUDA) and is willing to point this out to me or to help out, please send me an email! I’ve added the FaceDetector class framework and committed it, in the back I’ve also started porting the NPP face detector implementation from Nvidia to PCL. However as there is still some uncertainty on the license of this. I’m currently waiting for a reply from Nvidia before I will commit it to trunk. This includes a GPU Viola Jones implementation from Anton Obukhov, “Haar Classifiers for Object Detection with CUDA” explained in the GPU Computing Gems book. I’ve added a GPU Gaussian kernel convolution, this allows to add a system model to the human in order to have sensor fusion on the pixel labels. The prediction step will make use of the Gaussian uncertainty. I’ve also added the Gaussian kernel generation function. In the coming tutorial, we will show you how to implement the ‘well-known’ finger tracking algorithm on Kinect + Android + OpenNI + Tegra3 + OpenCV. The algorithm is indeed very simple and computationally efficient. We can achieve real-time performance easily on Tegra 3! We will be using the range camera (depth map) to create a contour of our hand. Then, we will perform a simple polynomial approximate on the contour, and extract the convex hull (the peaks) as our finger tips. All of these operations can happen in real-time on the Tegra 3 @ 25fps! That’s pretty impressive. 1. Tegra 3 or Tegra 2 Android device. First of all, the method provided here are simplified for real-time usage, and we can get better results if we have a better way of extracting the hand location and filtering the depth map (See Limitation section at the end). Right now, we are thresholding on a range, i.e., we assume that the hand of a person will be positioned closer to the range camera. Hand Tracking with 3D PointCloud Data rendering in real-time on Tegra3. Using the OpenNI hand tracking and create several interfaces. Right now we have the point cloud data visualization on Android controlled by the Kinect at 15-20fps (with about 2 million dots). I’ve finished the probabilistic label histograms in the people library, these are now part of the RDF detector class and will be added to the future detector classes as well, this will allow for easy probabilistic merging of the different detectors in order to improve the tracking results. Downside is that calculating them actually takes a lot of time, so I will look into doing them in NPP in the future and reorganising them from AOS to SOA architecture. With the SOA beeing image oriented. It’s been a while since I wrote a blogpost because I’m currently very occupied with TA and correcting exams for this. In the process we started the discussion how to redesign the PCL GPU sublibrary for the next releases of PCL. The goal is to remove PCL CUDA sublibrary by PCL2.x and keep only the PCL GPU sublibrary. I’m also thinking about a possible redesign of the DeviceMemory and DeviceArray structures that are currently beeing used. Feel free to contact me or Anatoly for pointers on this. I finally found the time to start putting the training pipeline code public, still the Makefiles of the public version need to be adapted, and this will most likely have multiple changes and API breaks within the next weeks, but the code can be found here: http://svn.pointclouds.org/people/. There is also a change that this will move to trunk/people in the future once this is fully in the PCL namespace. I had a great time presenting my work at ICRA, but still some small bug was present in the public version, from time to time the background was displayed as the correct kinematic chain, this is now solved in the current trunk version. This was because it was displaying without a check for the correct tree beeing build. Recently, we have received several emails about the OpenNI and Android development. Here we will address some of the most frequently asked questions and some of the future directions about this project. Q: What tablet have we used? Ans: We’ve used the Tegra 2 and Tegra 3 Development Board provided by NVIDIA. http://developer.nvidia.com/tegra-development-kits. I can safely assume that as long as your Tablet is as capable as Tegra 2, the OpenNI library shall be able to grab the depth map image and color images at 640*480 resolution at full speed. However, I have experienced some hiccups with the OpenNI drivers, especially the color image gets corrupted sometimes. Q: What are the minimum OS requirements? Ans: We’ve tested everything from Android 3.0 to Android 4.x. However, I noticed that I have got better performance on Android 3.x OS? That’s something I’m currently working on. Q: How could I know if my tablet work with the Kinect? Ans: Try dmesg under ‘adb shell’. You should be able to see the Microsoft Kinect is recognized as a USB hub with camera, motor, and audio devices. If you cannot see any USB devices attached, I believe we need to look into that further. Q: I’ve trouble getting the ‘multitouch’ sample code compiled? Ans: We notice that the NDK package from NVIDIA http://developer.nvidia.com/tegra-resources. There are some dependencies that become missing in the latest SDK. I’m current working on this (basically rewriting part of the code to be conformed with the “Android Application Lifecycle in Practice: A Developer’s Guide”. LINK: http://developer.nvidia.com/sites/default/files/akamai/mobile/docs/android_lifecycle_app_note.pdf . Please check this blog again in the future for a more self-contained package. Q: I’m getting errors when compiling the OpenNI library. What should I do? Ans: We would highly recommend others to use the binary (as provided in the last tutorial) for the first time. I will provide a sample script for recompiling in the future. Q: How do I push the .so libraries to the device? Ans: Please read the push_lib.sh file in the package. We’ve provided a few comments on how to remount the /system directory for read-write. Ans: I’m a Ph.D student studying ECE at UofT. I’m currently working with PCL and NVIDIA’s summer code program and free feel to let us know what you think about the Android project. everytime after you rebooted your device. The example code provided below has been tested on the NVIDIA Tegra 3 dev board and Microsoft Kinect only. If you would like to use Xtion or other range sensors, you may need to compile the drivers, and make appropriate updates to the modules.xml file. For more information, see our previous post. To get started, we will first introduce the simple c++ wrapper we have written for handling the OpenNI calls. In this example, we will be only handling the image buffers, the color image buffer (24 bits RGB image) and the depth image buffer (16 bits single channel). I believe we can also record audio with the Kinect (? ), but we have not verify that yet. Here we have the header files from our OpenniWrapper.h. Our wrapper consists of three main function calls, start(), release(), and WaitAndUpdate(). By default, the openni wrapper will initialize the depth map and rgb image and runs in a separate thread (i.e., non-blocking) after the start(). To obtain the depth map or rgb images, we simply call WaitAndUpdate() (blocking call) and then provide a pointer which stores our depth and rgb image. The OpenniWrapper does not provide any memory allocation and it is our responsibility to handle the malloc and free. You can find the openni_kinect_include/include directory from the SVN respository below. Or you can simply create that directory by copying the headers from the OpenNI source directly. I/Render Loop:(12539): Display loop 0.014692 (s) per frame –> over 60fps for rendering, the capture loop is threaded. The following video demonstrates point cloud streaming to mobile devices with real-time visualization. The point clouds are streamed from a desktop server to mobile devices over wi-fi and 4G networks. Point clouds are captured using the PCL OpenNI grabber with a Microsoft Kinect sensor. Visualization on the mobile devices is performed inside KiwiViewer using the VES and Kiwi mobile visualization framework. Ventana Development Kits or other Android Devices which supports USB. If everything goes well, we will see the following files in this directory. 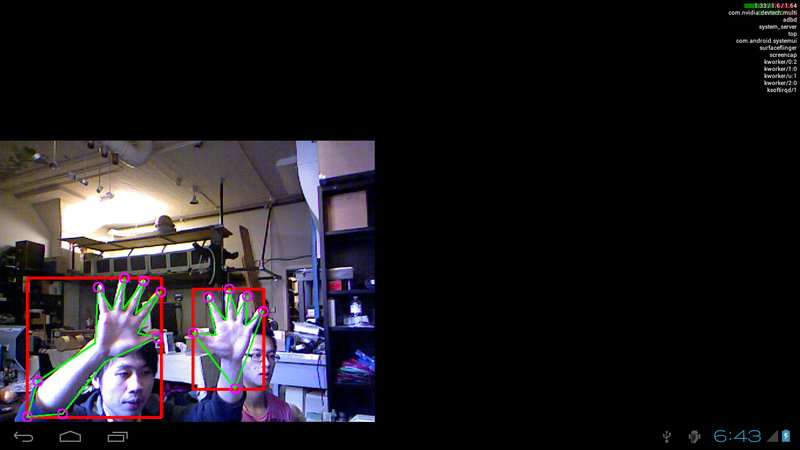 Now, we will compile the SensorKinect Driver. In runtime, the OpenNI framework will look for these shared libraries. To inform the OpenNI which modules to load, we need to commit this .xml file to this directory. It is very very important that all these files are put in the properly directories! Here is example modules.xml file we have used. #and we will need to set the flag UsbInterface to 1. Lastly, we will copy the SamplesConfig.xml to the /data/ni/ directory as well. You can find this file from the sample code in OpenNI or from our svn repository. That’s it! Now, we have the latest OpenNI + Kinect Driver compiled and install on your Android! In the coming up tutorial, I explain how we can use these drivers with NDK with sample codes! and more tricks are coming up! (e.g., mount -o devmode=0666 -t usbfs none /proc/bus/usb) !! If you would like to check if the modules are installed successfully, you can run trying niReg on your Android device. Hirotaka Niisato (http://www.hirotakaster.com/) has also provided excellent tutorials on how to compile OpenNI on Android! I would like to thank him for providing some of the basic scripts for compiling the libraries! ;). However, I’ve trouble running the sample code he has provided. Instead, I have ported the Sample-NiSimpleRead to run on Android instead. ;) Stay tuned! Here is the complete script we have used: copy and paste these and that will get you started. I’m recording a one person test dataset today which has Vicon measurement data in there as well. I’ll use the plug-in-gait model from Vicon to have something to compare the behavior of our algorithm against. As a first step this will just be a single person, in order to see how this data is best recorded and synchronised in order to have a more extensive experiment later on. In the meanwhile with help of Anatoly’s CUDA experience the peopleDetector now runs at a stable 6-8fps which can be considered adequate for online use. My hopes are that bringing in the prior fusion will only help speeding up this process. This expansion allows the detector to do sensor fusion based on data that can be fetched from other detectors (like face-detector). A more theoretical explanation to this will follow. This is my first blog post. Past two weeks I’ve been integrating the code for run-time RDF labeling into PCL together with Anatoly. The code is now arranged in the PeopleDetector class and all the CUDA code is converted to use the DeviceArray structures. For the Seeded Hue Segmentation (SHS) and Euclidean Labeled Clustering (ELEC) a custom function was implemented specific for our use case. For interested users: please keep on using the original version in trunk/segmentation and don’t use the one in gpu/people as that one is currently written specific.